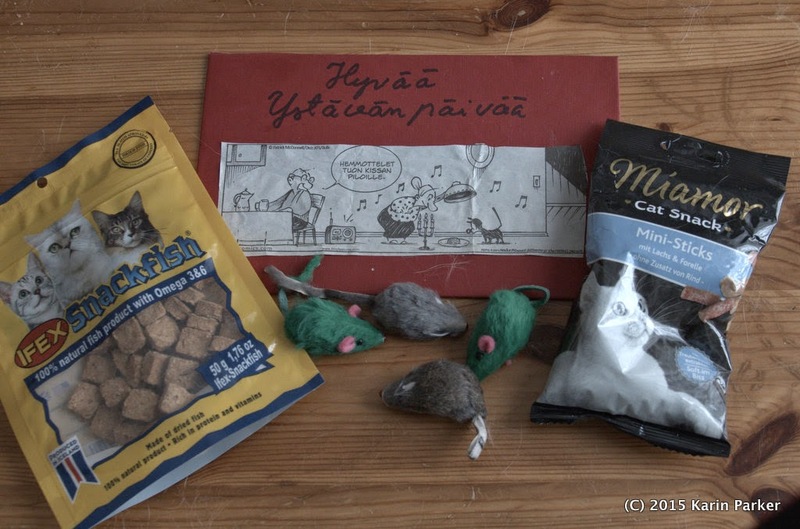 We got a parcel from Ruska's sister in Finland(S). We love these gifts that just appear in our mail! And this one contained some mousies. Äiti was so surprised that I found my inner kitten and played. I used to do this for hours when I was pikku pentu. Thank you so much Raisu and your family! New mousies can get annycat ecited again! There's nothing better than toys in the mail! You play just like a Boy King! And look at that FLOOFY tail! It is exciting to get a parcel of toys in the mail.You are never too old to play like a kitten. Eric used to like to play fetch and would carry his toys around like you. If mum ever threw them for me, I would tell her she is the best one to fetch them. Mowie-wowie ... mousies AND treats. What a haul! WOW! You had a wild hair up your tailio!! Mommy laughed and laughed, watching you bound around. You always need to embrace your inner kitten.